This website is dedicated for cooks around the world who wants to learn How To Cook Tamil Recipes Or Tamil Cuisine. 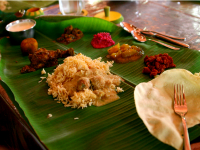 We have large varieties of tamil recipes to cook. We hope these recipes help you bring great cooking experiences. Recipes are explained step by step. Most sites has only one version of a recipe we brag of having different varieties of some recipes. Have you cooked this Tamil recipe before? if not Cook it and enjoy!